A Hindu woman splashes herself with water from the Bagmati River in Kathmandu. Like the Ganges River in Benares, India, the river is sacred to Nepali Hindus and people come from far away to bathe in the river. Most of my time in Kathmandu was spent documenting rebuilding after the earthquake, but I also did some travel feature photography in Nepal's capital city. It's a great city to photograph in. It reminds me a little of Barcelona's "Barri Gotic" neighborhood. Parts of Kathmandu are hundreds of years old and it feels like nothing has changed since the city's founding. 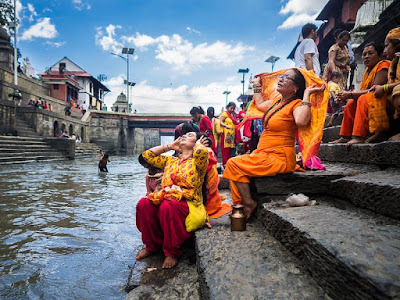 On the "ghats" women complete a pilgrimage to the Bagmati River. Even though Kathmandu is exploding - nearly a million people live in the metro area now - there's a timeless feeling to many parts of the city. Turn off a street into a courtyard in Thamel and it connects to another courtyard, which connects to yet another courtyard and before you know you've crossed the city without walking in a street. The courtyards, like courtyards in ancient cities in Europe, are public / private spaces. In that people use them to get across town and businesses have their storefronts in the squares and there are temples and shrines in the courtyards, they're public. In that they serve as people's yards and front porches, they're private. 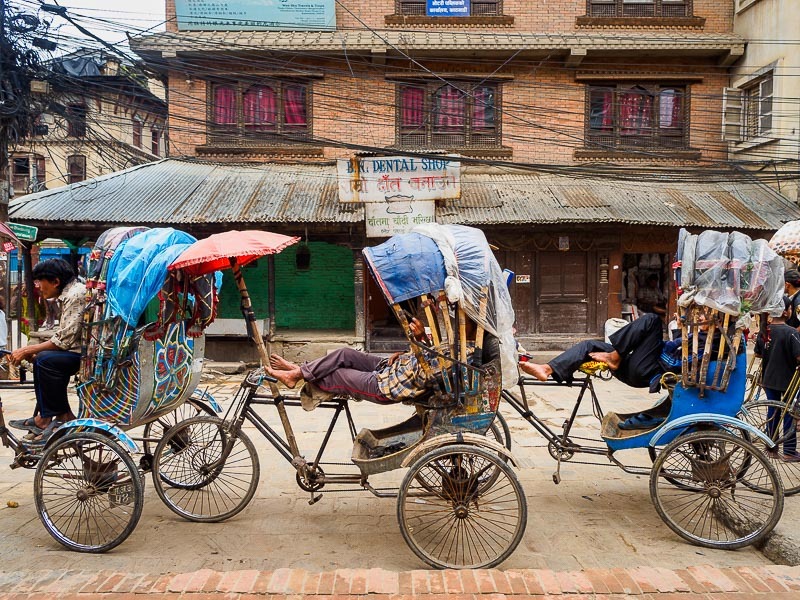 Pedicabs wait for fares in front of a building in Kathmandu. I was told the building is one of the oldest original style buildings in Kathmandu and was built in the 17th or 18th century. Some parts of the oldest parts of the city still don't have domestic water. People carry buckets to public wells and carry water home. Electric lines run throughout the city, but the "grid" is unreliable and power cuts are common. 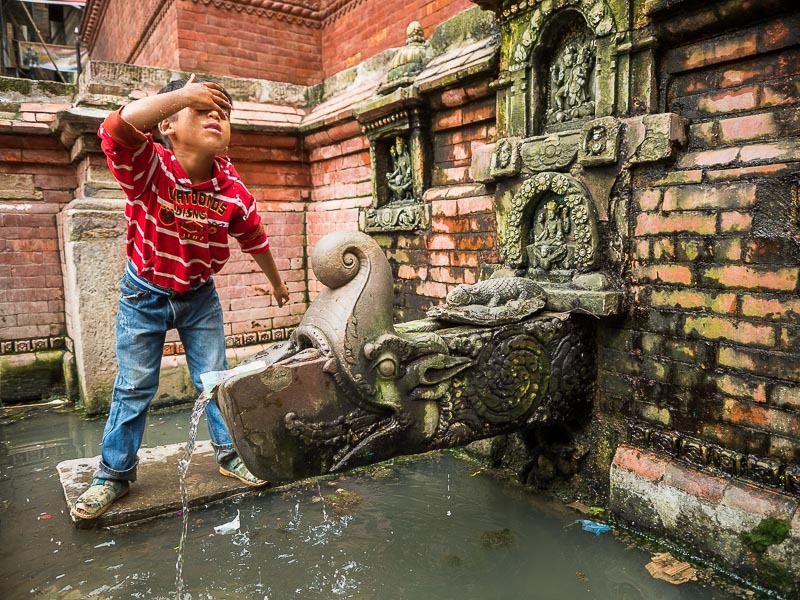 A boy washes his face at a public water well in Kathmandu. All day long adults come down to the well to fill buckets with water while children play in the centuries old courtyard. Remarkably, this well was undamaged in the earthquake. 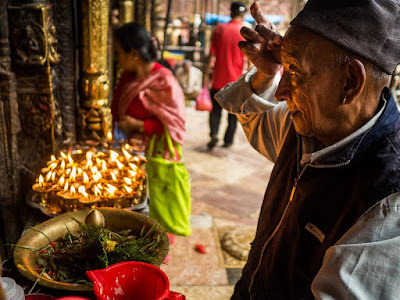 A man prays at Seto Machindranath Temple. The temple itself was undamaged in the earthquake though the homes next to the temple and the wall around the temple were destroyed. The temple was first built in the 10th century (900 CE). Kathmandu is a remarkable city. It's crowded, dusty (when it's not muddy) and loud. Drivers lean on their car horns like it will give them some superhuman ability to beat traffic, which is nearly as bad as Bangkok traffic. My biggest regret is that we didn't come to Kathmandu before the earthquake. People leave a Buddhist monastery on Sukra Path, a shopping street in Kathmandu. 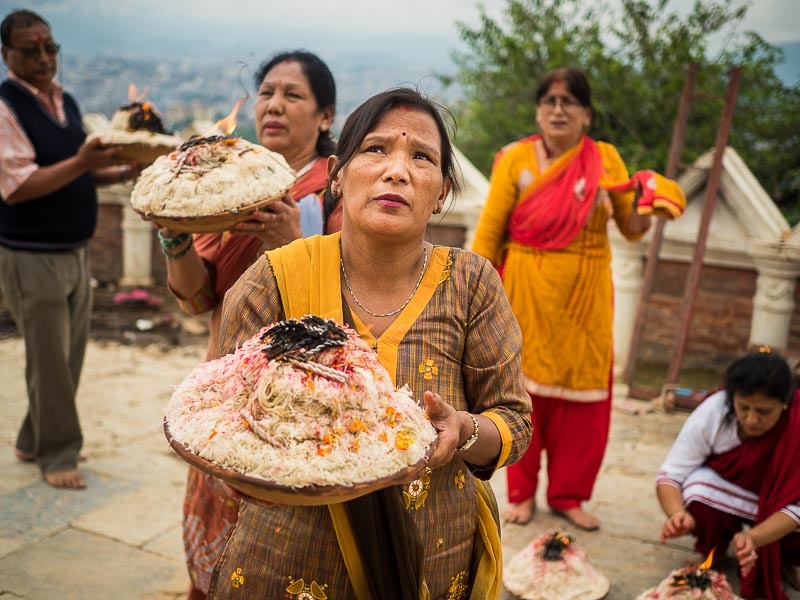 Hindu women make an offering at Swayambhunath Stupa, a Buddhist Stupa. Hindus and Buddhist share many religious sites in Kathmandu. 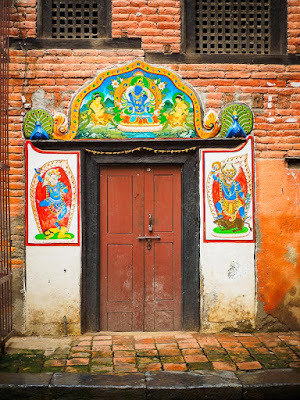 A doorway into a home in a Kathmandu courtyard. 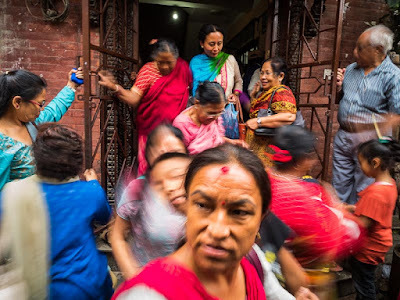 There are more photos from Kathmandu in my archive.